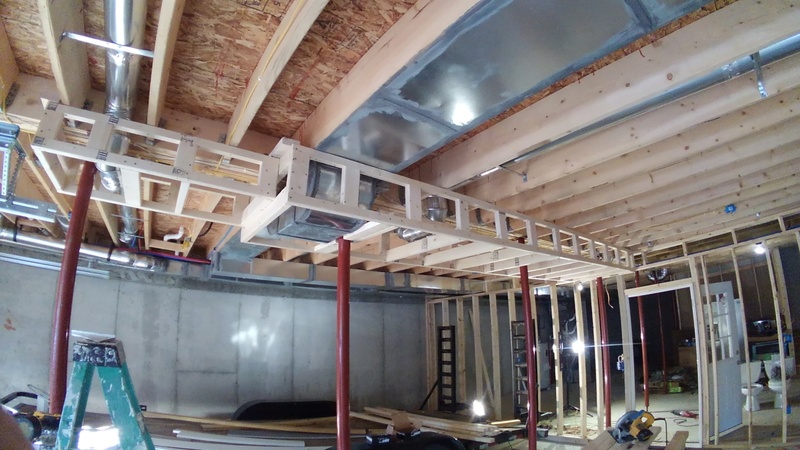 Soffit boxes enclosing duct work. This is a basement garage in a new house being framed for drywall. (The house was built by someone else.) Today I’m working on the soffit boxes on the ceiling to enclose the duct work. Tomorrow will begin the soffits near the overhead garage doors which when open will come uncomfortably close to the finished product. Since the garage is in the basement and the living area is above the garage, building code requires this area to be finished. The customers had a vision and I helped it come true. They did the lay-out for the walls and helped me with the framing and the drywall finishing, plus they had friends do the electric and plumbing. They also picked out all the tiles and delivered them to the job site. The tiles were installed using the Schluter System. 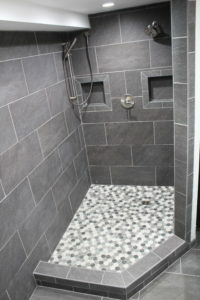 The wall tiles are 12×24 installed on Schluter Kerdi, and the shower floor tiles are six sided 2″ mosaics on Kerdi on a drypack mortar base on a concrete slab. 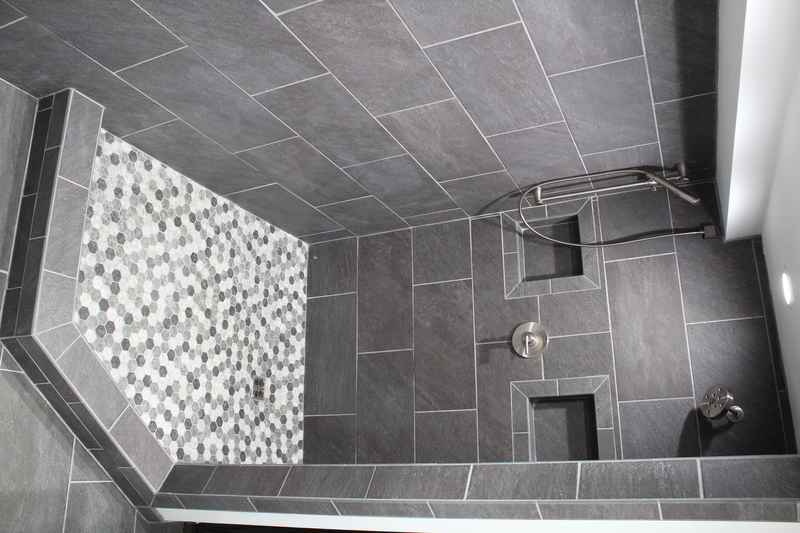 The floor tiles outside of the shower are the same 12×24 tiles installed on Schluter Ditra on a concrete slab. A tempered glass panel will be installed on the 135 degree curb opening. The rest of the curb will remain without a door though framing behind the tiles is there should a door be wanted. Also behind the tiles is wood blocking for hand rails should they ever be needed.